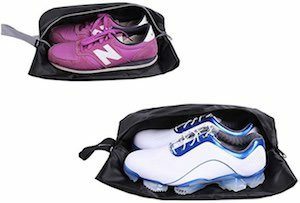 If you travel a lot with dirty shoes then check out these Waterproof Nylon Shoe Bags as they are made to keep your shoes neat while the rest of your luggage stays clean. These shoe bags come in a set of 2 (or 4) and they are two sizes so that small and big shoes all will be protected by this bag. And this bag is black and made of nylon and waterproof and closes with a zipper. Besides shoes, these bags are also handy for storing other things like maybe a wet bathing suit and towel in your sports bag. And if you have so many shoes that at home it starts to become and disorganized mess then now you can put a pair in a bag like this to store it neatly in your closet. This entry was posted in Uncategorized and tagged shoe bags. Bookmark the permalink.